This St Patricks Day Shamrock Pillow post is sponsored on behalf of Dollar Tree. All thoughts and experiences are my own. Decorating for St. Patrick’s Day can be tricky. You may be having a hard time finding household decor, especially if you are working on a tight budget. With help from Dollar Tree, you can craft some of your own St. Patrick’s Day decor for just pennies! 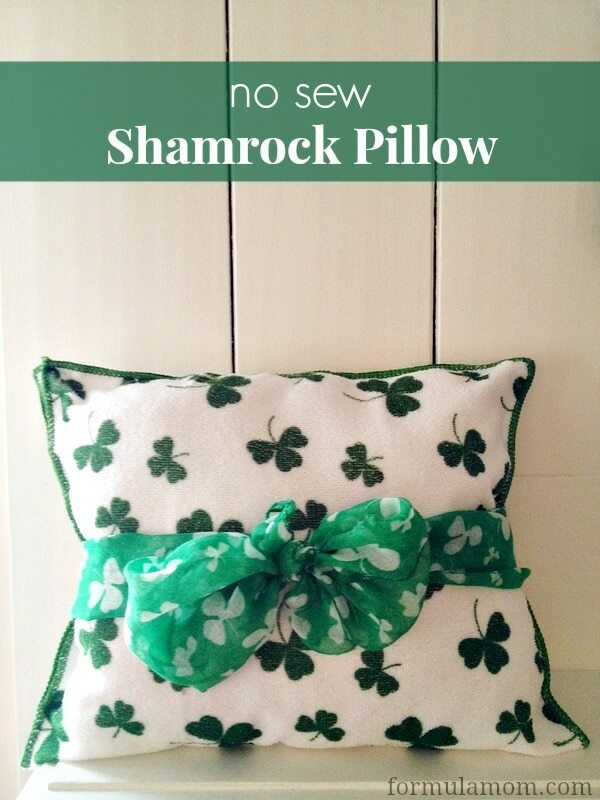 Take a look below at how to make your own St. Patrick’s Day Shamrock Pillow, a simple no sew pillow that you can whip up for under a few dollars. It is easier than you may think, so take a peek! We were able to find the towel and scarf at our local Dollar Tree store. We also used Dollar Tree paper towels for our stuffing as well as hot glue sticks from the store. As you can see, this is one St. Patrick’s Day craft that is just as frugal as it is fun! Fold your towel in half. Press it flat with your hands and make sure all of the edges line up nicely. Apply a layer of hot glue along the two sides of the towel. The top edge will already be closed since that is where you folded it, so just run glue along the two open side, leaving the bottom edge open. Press firmly to make sure the edges adhere. Take cotton batting, scrap fabric, or shredded paper towel and stuff the towel full. Get into the corners as much as possible so the pillow fills out nicely. Add a generous layer of hot glue to the bottom edges and press them firmly together. Your pillow should now take form and be sealed closed all of the way around. 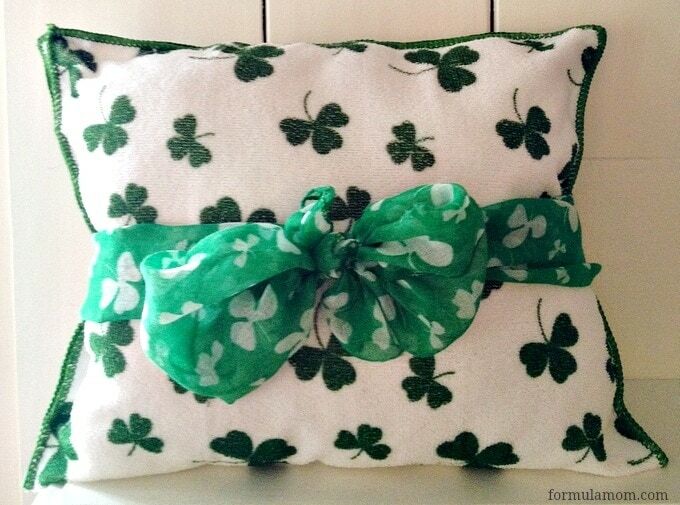 Finish your pillow by tying a St. Patrick’s Day themed scarf! So if you’re not the sewing type (like me! ), you can still have some fun holiday themed decorations around the house! And if you shop for your supplies at Dollar Tree you can do it without breaking the bank! How do you decorate for St. Patrick’s Day? That is so cute! I have a wreath to hang on the door that has little shamrocks all over it. That’s pretty much all I do to decorate. Oh what a neat idea and I love that you just used glue! I do not have a sewing machine, so never really make anything like this. Love this idea and I really need to decorate for St Patricks Day! No sewing is happening here! The last time I sewed was my 8th grade home ec project! This is super cute! Looks like a fun and inexpensive craft to do.